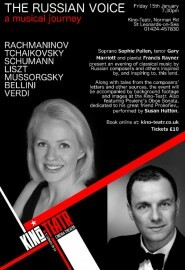 Soprano Sophie Pullen, tenor Gary Marriott together with pianist Francis Rayner and oboist, Susan Hutton present an evening of the classical music that formed the soundtrack of Russia’s musical life from the mid 19th century – Tchaikovsky, Mussorgsky, Rachmaninov, Liszt, Grieg, Bellini and Verdi, writes Chris Cormack. Appropriately it is at Kino-Teatr. Saturday 20 June marks the start of nine days of fish, food and drink-related festivities. Erica Smith tries to work out where the fishy festival ends and the food and wine festival begins.